floater, and pillar candles. Compared to a traditional candle molding machine, an extruder is automatic, and much faster in production speed. Our ZCHL24 tealight extruder is able to produce as many as 35000 tealights per hour. 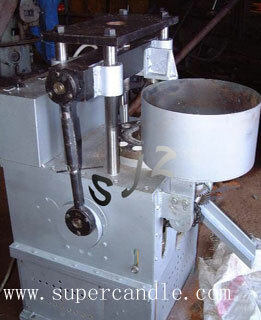 Besides, a candle extruder is more flexible than a candle molding machine. Our multi-function extruder can make tealight, votive and floaters, by changing molds. Since the molds of common candle molding machines are welded to the machine frame, if you want to make candle in the different shape or size, you will have to buy a new machine. We invite you to visit our website for more details of our candle extruders.